PureMadi, a nonprofit University of Virginia organization, has invented a simple ceramic water purification tablet called MadiDrop. The tablet — developed and extensively tested at the University of Virginia — is impregnated with silver or copper nanoparticles. It can repeatedly disinfect water for up to six months simply by resting in a vessel where water is poured. It is being developed for use in communities in South Africa that have little or no access to clean water. PureMadi’s first filter is already being produced. It is pictured below. PureMadi, the non-profit’s original filter, is larger than the MadiDrop tablet. The plan is to produce the PureMadi in 10 to 12 factories in South Africa with an ultimate goal of creating half a million filters per year. 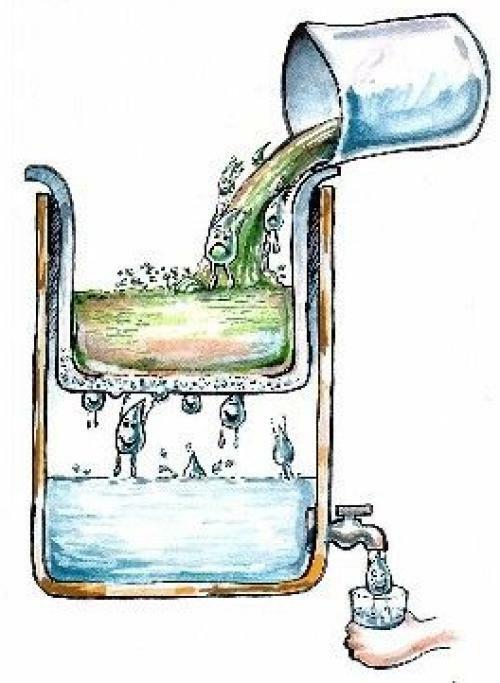 The user pours polluted water, such as river water, into the pot and it filters through the filter to a 5-gallon bucket below. The design allows a user to pour water from an untreated source, such as a river or well, into the pot and allow it to filter through into a five-gallon bucket underneath. The pot has a flow rate of one to three liters per hour, enough for drinking and cooking. The filtered water is accessed through a spigot in the bucket. Testing has shown that 99.9 percent of the pathogens in water can be removed or killed by the filter. MadiDrop, the most recent creation, is an alternative to the flowerpot filter, but ideally would be used in conjunction with it. The plan is to mass-produce the product at the same factories where the PureMadi filters are produced. MadiDrop is cheaper, easier to use, and is easier to transport than the PureMadi filter, but because it is placed into the water, rather than having the water filter through it, the MadiDrop is not effective for removing sediment in water that causes discoloration or flavor impairment. It is, however, more portable, easier to use, and less expensive. Testing shows that the filters are safe to use and release only trace amounts of silver or copper particles, well within the safe water standards of the developed world. The filters also would be useful in rural areas of developed countries such as the United States where people rely on untreated well water. Read the original in Science Daily.